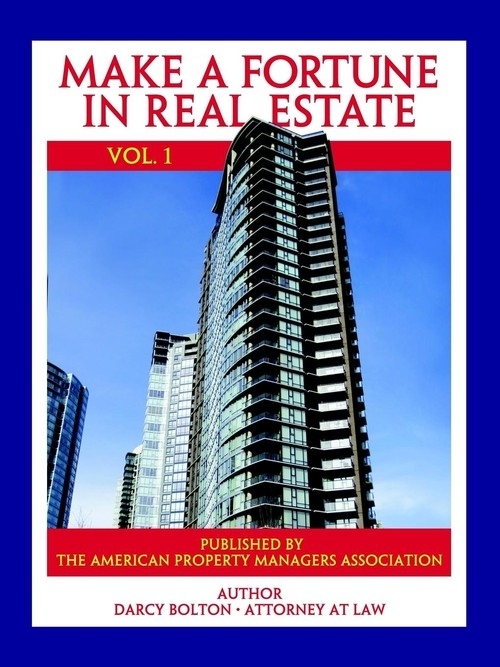 This book takes you step by step through appraisal, finance and the law of apartment property ownership.
. You will be able to appraise property using five different methods of setting a value on property and predicting cash flow.
. Learn about mortgages and deeds of trust and find out how to get the lowest interst rate.
. Learn how to how much to offer and how to draft an offer.
. It tells you in easy to understand language what Partnerships, Corporations and Limited Liability Companies can do for you.
. Find out what you need to know to protect yourself when choosing a management company.
. Learn about the latest trend in investing, Real Estate Investment Trusts.
. Study the alternative Insurance Programs and choose the plan that gives you adequate coverage at the lowest premium. Find out how Worker's Compensation Insurance can protect you and how Title Insurance can protect you when surprise claims and liens are placed on your property. I started investing in real estate with an old house which I purchased with $2000 down. A few years later I found out that California rents and values had fallen precipitously. Sellers were offering properties for nothing down. I took a chance on 104 units. At various times I have speculated in vacant land and owned more than 50,000 square feet of office space. To help me control maintenance costs better I obtained Contractor's licenses in General Building, Electrical and HVAC, (Heating Ventilation and Air Conditioning). I have contributed articles to the Apartment Management Magazine and took numerous courses in finance. In 1993 I became an attorney. Since then I have acted for myself or clients in about 600 cases, almost all of them in the area of real estate law, evictions, foreclosures and disputes over the title to land. At the present time I own over 100 apartment units and I continue to manage them with the help of on-site managers and full time on site service people.